Geneva lies between the Alps and the Jura mountains on the shore of Lake Geneva on the west side of Switzerland bordering on France. Geneva is the second largest city in Switzerland after Zürich. 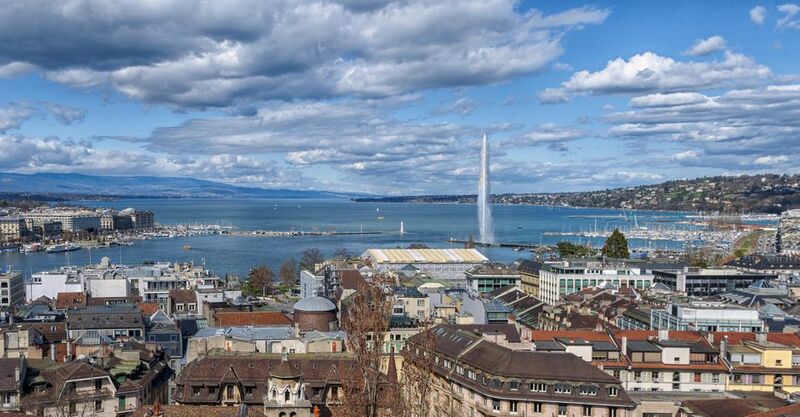 You can get to Geneva by air using the Geneva Cointrin International Airport. Because Geneva is located on the border with France, its main station, Cornavin Railway Station, is connected to both the Swiss railway network SBB-CFF-FFS, and the French SNCF network and TGV trains. Geneva is also connected to the rest of Switzerland and France via the A1 toll road. Geneva International Airport is three miles away from the city center. The train takes you to the city center in six minutes, with departures every 15 minutes. You can download maps and access plans from the airport web site. Free Transportation in Geneva tells you how to get to your hotel via train from the airport for free. The Gare de Cornavin is very central to Geneva, around 400 meters north of the lake. If you’re arriving on a SNCF (French) train, you'll arrive on platforms 7 and 8, and you'll have to pass through both French and Swiss customs and passport control before exiting the station. Carouge, 2km south of the city center, has been called the "Greenwich Village of Geneva" for its low slung houses, artist studios, and cafes in a place developed in the late 1700s, which then king of Sardinia Victor Amideus' Turinese architects envisioned as a trading competitor to Geneva and refuge for Catholics. It's worth half a day snooping around. Geneva’s Rive Gauche means shopping and banking, plus a view of Mont Blanc from the waterfront. Old Town is where you head for the market (Place du Bourg-de-Four), cobbled streets and austere grey-stone houses. Geneva is generally very pleasant in the summer. Expect a bit of rain if you go in the fall. For detailed historic climate charts and current weather, see Geneva Travel Weather and Climate. The main Tourist Office is in the central post office at 18 Rue du Mont-Blanc (Open Mon-Sat 9am-6pm) and a smaller one at the Municipality of Geneva, situated on the Pont de la Machine (Open Mon noon-6pm, Tues-Fri 9am-6pm, Sat 10am-5pm). Either tourist office can give you a free map and advice on what to see and where to sleep. You can download various city maps of Geneva in PDF form for printing from Geneva Tourism. For a list of top hotels in Geneva, there are several unique places to stay at every price point. If you prefer an apartment or vacation house, HomeAway offers vacation rentals that you may wish to check out. Geneva has many restaurants serving traditional Swiss cuisine as well as international favorites. Expect to find typical cheese dishes like fondue and raclette as well as lake fish dishes, smoked sausage and a variety of casseroles and stews. Cafe du soleil (www.cafedusoleil.ch) is renowned for its fondue. Those on a budget will want to check out: Five Cheap Eats in Geneva. You'll want to wander around Geneva's old town (vielle ville) for a glimpse of what life was like in the 18th century. While there, you'll want to visit Saint-Pierre Cathedral at the top of the hill in the heart of Geneva's old town. Here you can take an underground journey through the archaeological excavations to view remains from the 3rd-century BC right up to the time of the construction of the current cathedral in the 12th century. You can't miss Geneva's primary landmark, Jet d'Eau (water-jet) spews a 140-meter-high column of water over Lake Geneva. Art and History Museum - designed in the early 20th century as an encyclopedic museum, it tries to cover the whole of western culture, from its origins to the present days. International Red Cross and Red Crescent Museum - Geneva is the birthplace of the International Red Cross. MAMCO - Museum of Modern and Contemporary Art offers modern installations, videos, paintings, photographs, and sculptures. Ariana Museum - the only museum in Switzerland devoted entirely to kilncraft--ceramics and glass. Conservatory and Botanical Gardens - see a collection of 16,000 plant species from all over the world along the waterfront. Martin Bodmer Foundation - a private library that contains 160,000 documents in 80 languages, among which one of the few copies of the Gutenberg Bible. International Museum of the Reformation - retraces the history of the Reformation movement initiated by John Calvin in Geneva. Also see: Free Museums in Geneva.